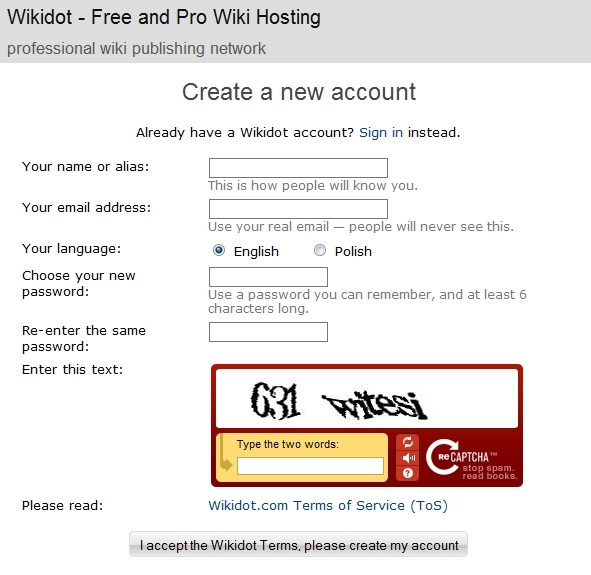 This page describes how you can create an account on Wikidot.com. 3. Verification of Your Email-adress ! a good unique user-id (your "screen name", unique inside the wikidot.com network). a valid mail-adress where the system can send the acknowledgment (this email requires a response from you for security purposes). a decision on which language you prefer to use (right now, the choices are English or Polish, and all 80% translated languages from the "Translate" wiki). This choice only affects the internal pages within the wikis you create. a good password for security. and good eyes to answer a security question to protect the wikidot system from evvvvvil robots. Finally, you klick on the "I accept the…." link button and aggree to the Terms of Service of wikidot.com. After clicking on this "Acceptance" button You will get a verification Email to your address - PLEASE WAIT for this! In this Email is a link to click on - You make an acknowledgement to Wikidot - that YOUR Email-Adresse belongs to your User-ID. could be the wikidot server is overloaded and needs more time - please wait or try again later. We know from problems with hotmail addresses - if you do not get any email please mesage us! Your my account menu button leads you to your personal Account settings; it is a good idea to set up those settings right off. Just follow the link!